Peter Rabinowitz MD MPH directs the Center for One Health Research. The Project explores linkages between human, animal, and environmental health in a "One Health" paradigm, including: zoonotic infectious diseases at the human-animal interface, animals as "sentinels" of environmental health hazards, and clinical collaboration between human health care providers and veterinarians in a species-spanning approach. 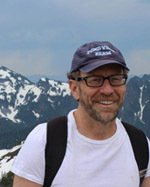 A goal of the Project is to serve as an incubator and organizer of research, training, and clinical activities at the University of Washington related to the human-animal-ecosystem interface. Dr. Rabinowitz also directs the Canary Database, an online resource for evidence about animals as sentinels of environmental health threats from both toxic and infectious hazards. He has been a visiting scientist at the Global Influenza Program of the WHO, and also in the Animal Health Division of the U.N. Food and Agriculture Organization (FAO) where he researched zoonotic diseases. He is the co-editor, with Lisa Conti DVM, MPH, of the clinical manual Human Animal Medicine: Zoonoses, Toxicants and other Shared Health Risks. (Elsevier 2010) He is co-director, with Malika Kachani DVM, PhD, of the Stone Mountain Working Group on One Health Proof of Concept Research. Dr. Rabinowitz completed a Family Medicine residency through the University of California San Francisco (Salinas Program). He has also completed fellowships in General Preventive Medicine and Occupational and Environmental Medicine at the Yale School of Medicine, where he served as Associate Professor in the Department of Internal Medicine and Director of Electives for the School of Medicine. What chronic wasting disease and mad cow disease can teach us about humans.